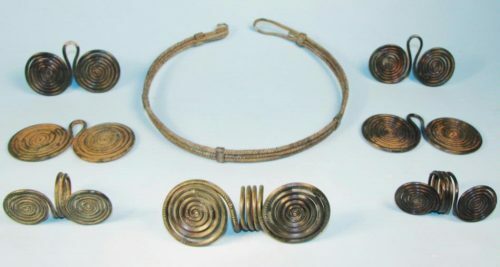 Late Bronze Age European Spiral Torque and Ornaments group of jewelry. Who doesn’t love jewelry? Throughout the history of humankind, bling in various forms have been adored, revered, passed on and taken to the graves. Most recently, archaeologists in southern Greece discovered an undisturbed tomb (approximately the size of a small house) which belonged to a Bronze Age nobleman with a penchant for jewelry. Greece’s Culture Ministry says the 3,350-year-old chamber near Orchomenos, an important centre of the Mycenaean era, belonged to a man who was 40 to 50 years old when he died. The nobleman’s tomb contained pottery vessels sheathed in tin, bronze horse bits, jewelry, bow fittings and arrowheads. The ministry says jewelry is more typically associated with the burials of Mycenaean women. So apparently, the man’s love of jewelry rivaled any Mycenaean women!